F³ Tech (Farm-Fish-Food) is a statewide private/public initiative that is creating a new renaissance of economic growth and prosperity through innovation and technology which is built upon Maryland’s traditional industries of agriculture and seafood. The overall program is a pipeline of three components through which entrepreneurs, innovators, startups, and existing businesses go through the proof-of-concept and commercialization of new product and service ideas and innovations. The initiative includes partners and resources from throughout Maryland. Maryland enjoys a rich history built upon its traditional industries of agriculture and seafood. Over the decades these industries have become eclipsed by other industry sectors which through time have developed into Maryland’s priority industries for economic development. These include biohealth/life sciences, IT/cybersecurity, aerospace/defense, military/federal, manufacturing, and export, all primarily concentrated within the Baltimore/Washington DC corridor. There are many obvious reasons for why these priorities and concentration exist. However, they do not help to address the critical need in rural Maryland to have its own industry cluster and corresponding economic growth and prosperity. A conversation among economic development service providers began during 2015 on Maryland’s Eastern Shore to advance a regional strategy and industry sector focus based upon the region’s strength in agriculture and seafood. Continuing in 2016, broader discussions with industry and regional stakeholders raised an increasing awareness that rural Maryland would benefit from a new generation of innovation and technology within agriculture and seafood. 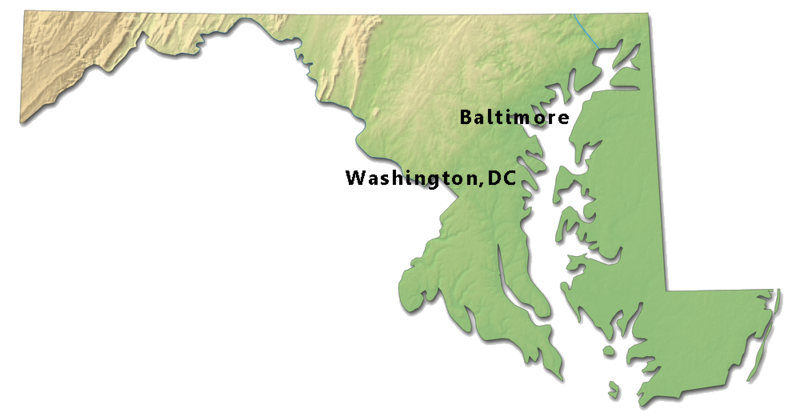 A recognized differentiator for Maryland, apart from land-locked regions in the U.S. involved in agriculture technology, is rural Maryland’s holistic environment of both land and water (Chesapeake Bay estuary). This unique feature allows for advancements in aquaculture in combination with agriculture technologies and their related environmental aspects. Another realization was that efforts could be enhanced by the proximity to the strengths, talent, and resources of the Baltimore/Washington DC corridor, leading to the conclusion for a major initiative in agritech, aquatech, and envirotech. The many problems and challenges within this industry sector can only be solved with new innovations and technologies that can be developed and tested. Rural Maryland is a unique area in the country where farming and fishing are so closely entangled that it serves as an ideal testbed for the demonstration of such innovations and technologies. Proven technologies could then be used in many other areas of the country where farming impacts fishing, and in turn, food production. This industry focus served by F³ Tech leverages a unique feature that Maryland offers and cannot be found elsewhere in the US. In addition, the rural areas of Maryland are close to additional resources that are available within the adjacent Baltimore/Washington, DC corridor (i.e. universities, incubators, USDA Agricultural Resource Service). This proposed focus brings together the entire agriculture and seafood community to identify problems, find solutions, test them, turn them into products, and distribute those products across the country. This can only be done in our region because of its features and the various other (non-natural) resources available in the area. A successful F³ Tech initiative and ecosystem requires key elements across innovation, access to capital, and access to talent. Initiative activities are intended to attract participants, entrepreneurs, and innovators from a whole host of disciplines and expertise. 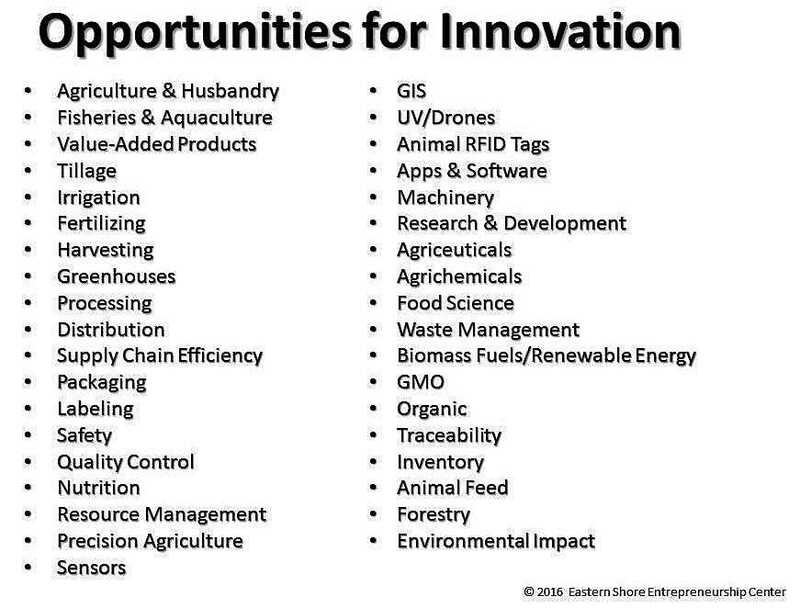 The opportunities for innovation within the entire food supply system are extremely multi-disciplinary. Participation and outcomes in F³ Tech are not restricted to just farmers and watermen. A sampling of the many opportunities available for innovation within the F³ Tech cluster is represented in the adjacent image. The strategic planning efforts described above have led the partners and collaborators to the development of a proof-of-concept and commercialization program titled F³ (Farm-Fish-Food)Tech which is a pipeline of activities aimed at establishing an industry sector focus or cluster in the areas of agriculture, aquaculture, and environmental technologies. Another significant outcome of the region’s efforts is an approach that represents a complete paradigm shift in the approach to facilitating better opportunities of success for early-stage entrepreneurs, innovators, and startup businesses no matter the location within the State of Maryland. This worldwide demand can only be met through innovation and technology. Any innovations and technology developed in addressing this need offers the additional opportunity to commercially export the resulting intellectual property to Third World countries frequently suffering from the very same challenges and issues. The framework of F³ Tech is based upon three activities which are intended to feed or pipeline entrepreneurs and innovators into subsequent stages: Stage 1 – Incubator Stage (Challenge Events), Stage 2 – Hatchery Stage (Pre-Accelerator), and Stage 3 – Nursery Stage (Accelerator).